SYRACUSE, N.Y. - The Pawtucket Red Sox forged a five-run comeback in the seventh inning to tie the game, but the Syracuse Mets responded an inning later to claim a 6-5 win in the series finale Sunday afternoon. The Mets (3-1) took three of four from the PawSox (1-3) in a series that featured a pair of extra-innings games and another one-run battle. After falling behind 4-0 in the third inning and 5-0 in the sixth, the PawSox went to work in a seventh inning in which they sent 10 batters to the plate. With the bases loaded, newcomer Gorkys Hernández laced a three-run triple to the left-field corner to pull Pawtucket within two. 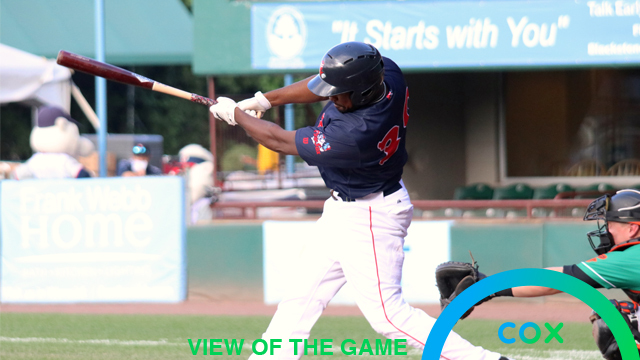 Michael Chavis added a sacrifice fly and, two batters later, Josh Ockimey tied the game with an RBI bullet to the center-field wall to make it 5-5. Castillo (2-for-5), Sam Travis (2-for-5) and Mike Miller (2-for-4) each notched multi-hit games, and Chavis made his regular-season professional debut at second base. Pawtucket left-handed reliever Josh Taylor got saddled with the loss, though he fanned four in two innings. Starter Josh Smith struck out seven in 4.2 innings in which he allowed three earned runs. The PawSox continue their road trip in Buffalo beginning Monday at 6:05 p.m. Pawtucket right-hander Ryan Weber (9-6, 2.73 ERA in Durham in 2018) is scheduled to oppose Bisons righty David Paulino. Radio coverage on WHJJ (920 AM and 104.7 FM) and throughout the PawSox Radio Network begins with the pre-game show at 5:35 p.m.
Pawtucket's home opener is slated for Thursday (April 11) at 6:05 p.m. Good tickets are available, and fans can visit the McCoy Stadium box office, which is open Monday-Friday from 10 a.m. through 5 p.m., and during all home games. Fans can also call (401) 724-7300 or log on to PawSox.com for tickets.